The week before Christmas saw hubby and I heading south to the Costa del Sol and Nerja. This part of the Andalucian coast boasts over 300 days of sunshine a year. We were unlucky! But with those grey skies we were also fortunate as there weren't the crowds of tourists as on our last visit. Our journey towards the sun took, as it usually does, longer than we expected, but we arrived and found the AndaluciaTravel Bloggers members being shown around Nerja. That is what I love. Arriving somewhere and wandering the streets, acclimatising and getting away from the main tourist sites. 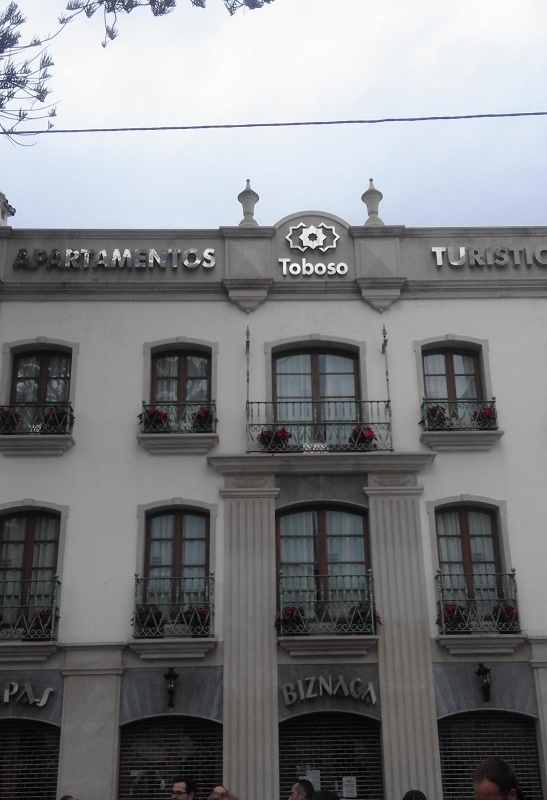 Our stay was in the Toboso Apar-Turis a very nicely situated hotel with apartments, more or less, on the Balcon de Europa and our 'suite' had swimming pool and sea views. A bonus of a winter stay is that it was quiet and of course the pool was empty. I could imagine it being thrivingly busy and noisy in the summer months, making it a great place for families. The Balcon de Europe started life as the 'Low Castle' situated between rocky cove beaches at the beginning of the 16th century. As a natural outcrop it was then altered in the 18th century and equipped with canons only to be destroyed during the Spanish War of Independence. In 1885 King Alfonso XII visited Nerja and impressed with the views is said to have exclaimed that he'd found the 'Balcony of Europe' a few years later a bronze statue of the King gazing out across the Mediterranean Sea was erected. Our mosey around town then became a Tourist Train ride to nearby Maro and the incredibly awesome Cuevas de Nerja or Nerja Caves. I'd read about them, seen photos of them, heard my then 10 year old son rave about them after a school trip, but I had never been. The whole story of how a group of friends discovered the caves in 1959 after seeing bats fly out of a sinkhole was relayed by one of their sons. Something which was rather special knowing the 'guide' had grown up with this story and knowledge of the caves firsthand from his father. Our visit was only to one of the many cave sections, and the feeling of awe of the natural formations, the hugeness of the caverns is beyond price. Amost surreal, as if we were inside the bowels of an enormous film set. There's nothing like nature to remind us how small and insignifcant we are. 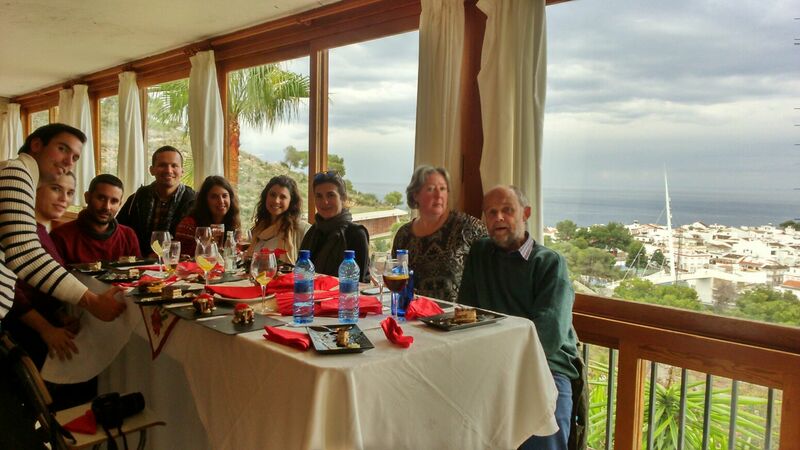 After the cave visit we had lunch at the on site Restaurant Cuevas de Nerja with views over Maro and the sea beyond. 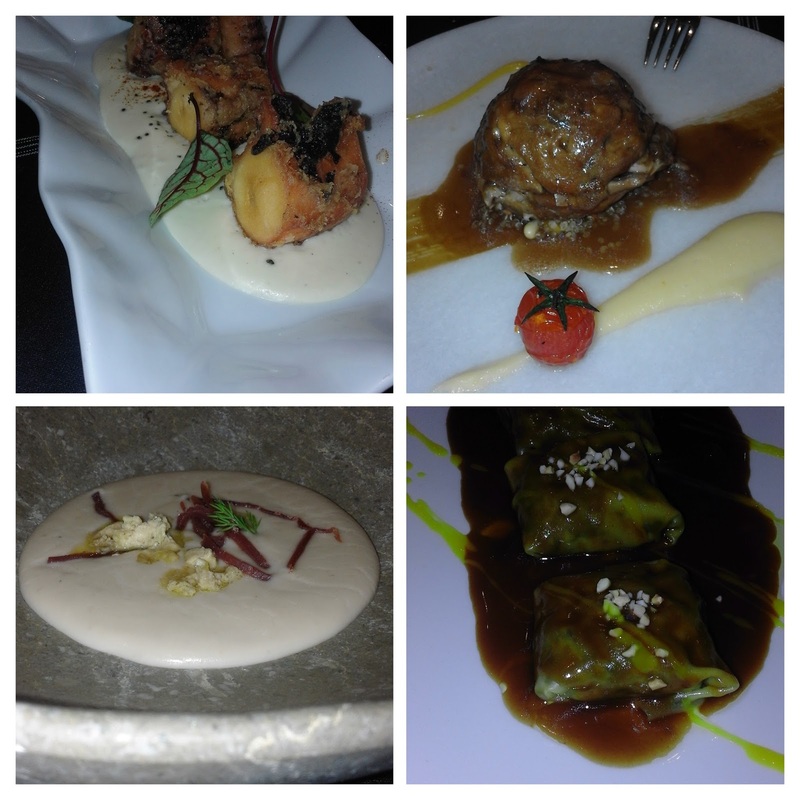 The range of tapas was very good and beautifully presented on slate plates, I'd certainly eat there again. Then back on the train to the town and after a short meander we stopped at the gorgeous little tearoom room, or Teteria, Zaidin for tea and cakes! A long walk was needed, but unfortunately we'd hit the other 65 days of the year and it was raining, so we retreated to our apartment to have a break, a social media catch-up and get ready for dinner! It was hard work all that eating. The evening saw us in Restaurant Patanegra 57 a lovely spot not far from the Balcon with very good food cooked and run by Sergio Paloma who worked with Martin Berasategui the famous Basque chef. We tried a wide range of fabulous, beautifully presented artistic tapas from Octopus with Creamed Potatoes to Oxtail Ravioli with Cream of Cauliflower and a Port Wine Sauce all were excellent. 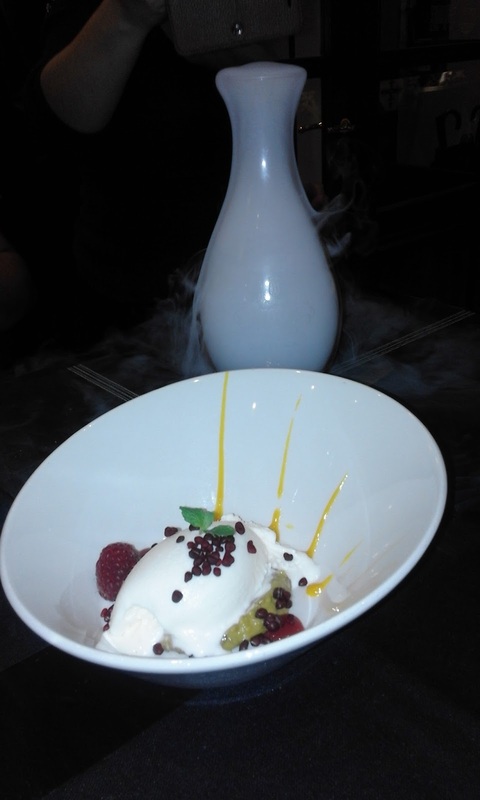 Then to top off these fine creations we had a Semi-cold Yoghurt with Crunchy Pistachio and Raspberry. 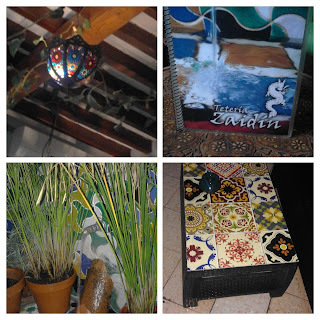 We will be back at Patanegra 57 when possible. A bracing ramble around the Balcon and town saw us replete in so many ways and concluded a very satisfying day in Nerja. Followed by a morning visit to the museum - Museo de Nerja where many remains found in the caves are on show. If you go buy a ticket for all three, museum, train and caves. One of the incredible finds amongst many is a full skeleton of a young woman displayed as a whole rather sad or macabre thought to be more than 8,000 years old. The museum, in Nerja centre, hosts an incredible array of finds and exhibitions, which if you're visiting the caves need to be seen as well. Then to the beach and Restaurant Playa Torrecilla for a farewell meal, although we chose to sit indoors, it started brightening up and later diners sat outside. After a full, in more ways than one, itinerary we said thank you and au revoir to all because we shall be back, there's so much more we want to explore. Next time it'll be away from the coast and inland to the mountains behind the town. A big shout out to Nerja Tourist Board for hosting some members of Andalucia Travel Bloggers. Update: February 2019 - it's now 60 years since the accidental discovery of Nerja Caves.